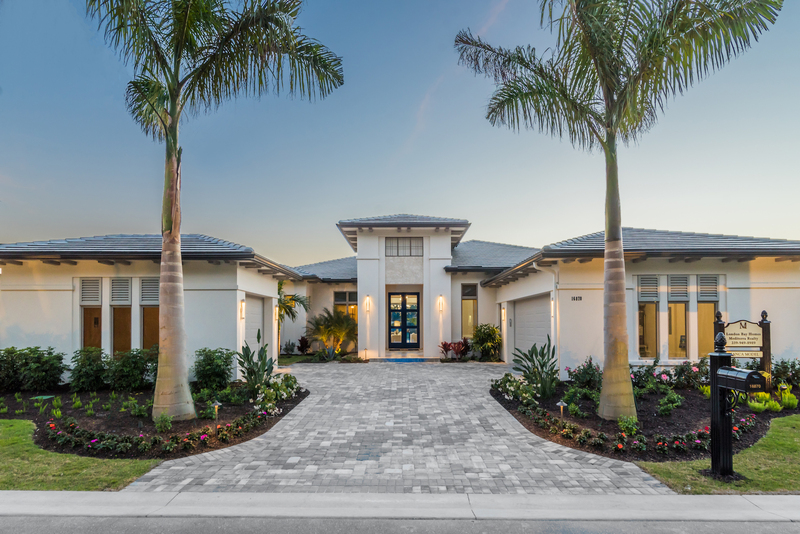 London Bay Homes’ Adalia model at The Lake Club offers maintenance-free living with gorgeous lake views and an open floor plan, and now, you can live the Sarasota lifestyle in this semi-furnished villa home for a reduced price of $899,000. The maintenance-free Adalia villa home features three bedrooms, plus a den, and three bathrooms in its 2,810 A/C square feet. Its spacious design allows homeowners and guests to pass freely from each section of the main living area and enjoy breathtaking lakefront views from multiple points in the home. Sliding glass doors in the great room and dining room provide access to the outdoor living area, which will have a summer kitchen with stainless steel grill, refrigerator, and sink. Extending past the seating areas of the outdoor space is a tri-colored pool and patio deck in vanilla, white, and coconut-toned pavers, installed in a basket-weave pattern, and a glazed tile pool water line where you will be able to relax with your toes in the water and the sun warming your face. A clear view of the glistening lake can be seen from every point of the outdoor space with the absence of screens and maintenance free living will ensure the view is always picturesque. Sliding glass doors in the master bedroom provide private access to the outdoor living area, but you may never want to leave with the large suite featuring his-and-her walk-in closets, a separate freestanding soaking tub, and a glass-enclosed shower clad with tumbled tile in champagne gold. Offered as a semi-furnished home, the Adalia villa home displays designer furnishings and finishes selected by Michael Scott of Romanza Interior Design, who choose simple, neutral tones to enhance the home’s overall appeal with a pop of color in the main living areas. Venetian gold granite kitchen countertops, fresco cream painted walls, and café colored cabinetry join the subtle, warm orange hues throughout the great room, dining room, and kitchen. Wood and gold accent pieces adorn complementary walls and seamlessly flow with the classic Mediterranean-inspired architecture of Matera at The Lake Club. The Matera neighborhood features Old World comfort and charm extended from its luxury villas to the beautiful lake views that lie adjacent to each of the 35 home sites offered in the neighborhood for a beautiful blend of design. 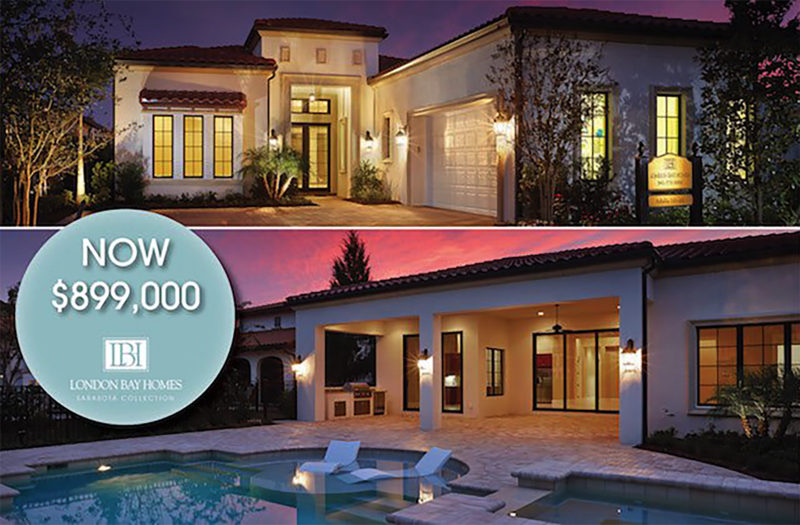 Luxury villas in this neighborhood range from 2,500 square feet to more than 3,500 square feet, and each floor plan chosen provides ample opportunity for customization by America’s Best Builder, London Bay Homes. Residents of London Bay’s Matera neighborhood at The Lake Club are the only residents at The Lake Club that enjoy landscaping, pool, and exterior maintenance provided through the community’s homeowner’s association, allowing an easygoing lifestyle free of upkeep. You’ll want to spend that extra time indulging in the luxury amenities of this new home community, such as spending time in the Grande Clubhouse in the day spa, taking advantage of the Club’s concierge services, taking up a match with friends on the tennis courts, or enjoying a leisurely walk through the community’s one-mile park. Scenic lakes, decorative bridges, and lush landscape will create the tranquil environment you deserve while you breathe in the fresh air of the “green” community. 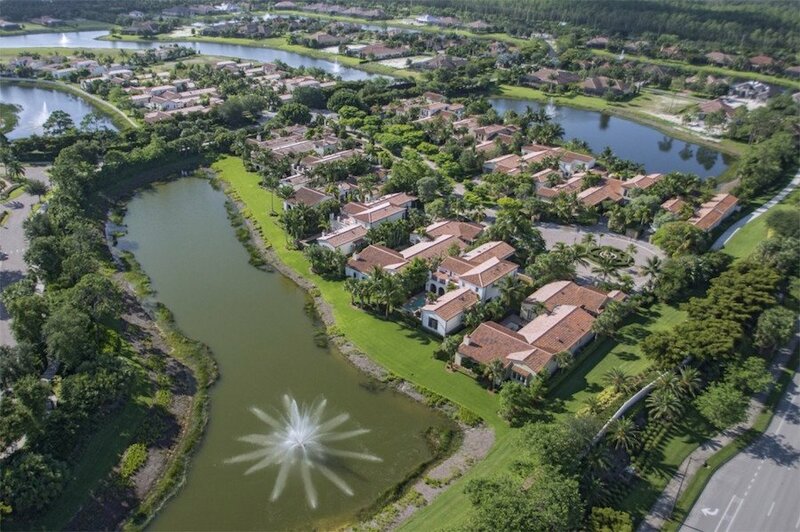 The Lake Club Lakewood Ranch is a designated “green” area of the award-winning master planned Lakewood Ranch community, meaning all homes meet strict standards for energy efficiency, clean indoor air, sustainability, and drought-resistant landscaping. Schedule your tour of the Adalia model home by London Bay Homes and the award-winning Lake Club community in Lakewood Ranch.